Nestled at 46th Avenue South and South Ocean Boulevard in the Windy Hill section of North Myrtle Beach, South Carolina is a four-story North Myrtle Beach resort that is built on stilts. Ocean Breeze Luxury Villas is a mid-size North Myrtle Beach resort that is right across the street from the Atlantic Ocean and white sandy beaches. The North Myrtle Beach rentals that are in this North Myrtle Beach resort are top-of-the-line North Myrtle Beach condominiums and luxurious North Myrtle Beach vacation rentals. This North Myrtle Beach resort features a second-floor pool deck where you can take a refreshing dip in the sparkling blue swimming pool and lounge poolside with a good book. The sun shines down right in the center of this North Myrtle Beach resort and squarely onto this pool deck. From this pool deck you can see palm trees and feel the sea breezes as they roll in off of the Atlantic Ocean. The North Myrtle Beach vacation rentals that are available for your North Myrtle Beach vacation are quite spacious. 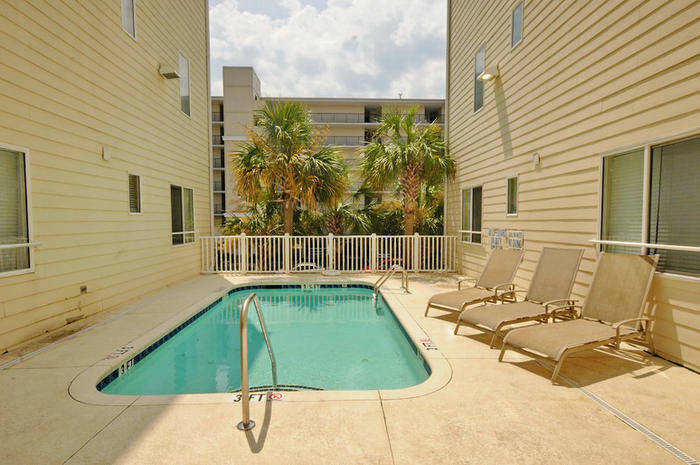 Luxuriously furnished with all of the modern amenities and creature comforts of home, these North Myrtle Beach condominium rentals are exquisite. Choose an extra large five-bedroom, five-bath North Myrtle Beach vacation rental. These spacious North Myrtle Beach condominiums sleep 18 or 20 people. Many of the bedrooms in these North Myrtle Beach condos have two beds and some of the living rooms have a sleeper sofa. A slightly smaller North Myrtle Beach condo rental at Ocean Breeze Luxury Villas is the four-bedroom condominium. With four baths in each of these condos in North Myrtle Beach, SC these units are ideal for 14 or 16 people, perfect for a golf foursome that brings along their spouses. The three-bedroom North Myrtle Beach condo at this North Myrtle Beach resort is still quite large and luxurious. There are three baths in each of these North Myrtle Beach rentals and there is room enough for anywhere between 10 and 14 people to enjoy a North Myrtle Beach vacation together. All of these North Myrtle Beach vacation rentals have a fully furnished kitchen with a dishwasher. Take advantage of far more than a microwave in these North Myrtle Beach condo rentals and use the stove and oven. A full-size refrigerator in your kitchen means you can easily keep your drinks cold and on hand when you need something refreshing. Elliott Beach Rentals is not affiliated with onsite management or the HOA of Ocean Breeze Luxury Villas.